Below, left: Michael Petrie 2016. 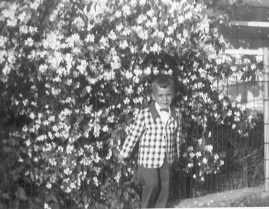 Center: b&w photos of Michael Petrie circa 1955, when the love of gardening began. Below, far right: Michael Petrie installs an Image Garden for Lori Stringer Photography. Far right, bottom: Michael Petrie 2011 Major Exhibitor Behind the Scenes video for PHS online..
Michael Petrie is known in horticultural circles for his wildly beautiful and unconventional award-winning exhibits for the Philadelphia Flower Show, many of which have won BEST IN SHOW. 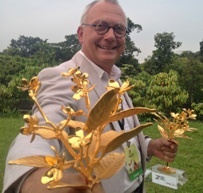 Recently, Petrie earned the right to add the word international to his award-winning garden designer laurels, having won both GOLD and BEST OF SHOW in the Fantasy Garden category at the 2014 Singapore Gardening Festival, along with a SILVER MEDAL at the 2013 Gardening World Cup in Nagasaki, Japan. In 2016, by invitation, Michael Petrie returned to the 2016 Singapore Garden Festival where he won SILVER, once again exhibiting in the Fantasy Garden category. For over 30 years, Petrie has designed and built exhibits for major companies and institutions including the former J. Franklin Styer Nurseries, where he worked for over two decades; the Winterthur Museum; and The Brandywine River Museum . His artistry has received attention in national media including The New York Times, The Washington Post, Country Gardens magazine and Architectural Digest online. He has been interviewed about horticultural topics on both national and local television and radio. His home garden has been featured on the Good Morning America television show. His Philadelphia Flower Show work was featured in the book The Philadelphia Flower Show: Celebrating 175 Years by Adam Levine & Ray Rogers, pages 195 and 196. Michael Petrie is the owner of Michael Petrie’s HANDMADE GARDENS. Originally launched in 2008 to include a retail plant nursery and garden shop in Downingtown, Chester County, PA, HANDMADE GARDENS reconfigured and relocated to Delaware County, PA in 2011. The company now concentrates on gzarden design consultations and installations for client homes and businesses in the greater Philadelphia areas — and beyond. As a garden designer, Michael’s work differs from what is commonly seen in the industry, notably excelling in visual, compositional and emotional appeal as well as balance and originality. 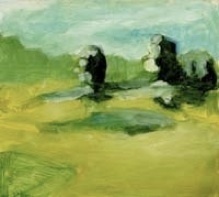 This is primarily because, in addition his experience as an award-winning national and international Flower Show exhibit designer and horticulturist, he is both an intuitive and trained artist, having studied painting, photography, printmaking and other arts at both the Philadelphia College of Art (now the University of the Arts) and the Pennsylvania Academy of Fine Arts. Michael Petrie is an experienced public speaker, having delivered lectures at Winterthur Museum and Gardens, Haverford College, Ladew Topiary Gardens, the Longwood Gardens continuing education program and The Scott Arboretum at Swarthmore College. Michael is available for talks and horticultural workshops. Call him directly on his cell to talk about about topics and fees: 610.505.8262. •Multiple Best Achievement Awards for " for Blending Horticulture, Landscape and Artistic Elements" (2012) and “for Exceptional Horticultural Experience” for “Bamboo” exhibit (1999). 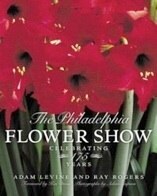 Read about Michael Petrie’s Philadelphia Flower Show work in the book The Philadelphia Flower Show: Celebrating 175 Years by Adam Levine & Ray Rogers, pages 195 and 196. Exhibitor: SINGAPORE GARDEN FESTIVAL 2016 Winner SILVER Medal! Exhibitor: SINGAPORE GARDEN FESTIVAL 2014 Winner BEST OF SHOW! 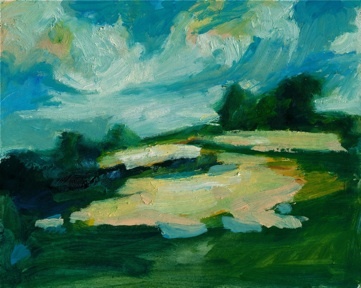 Michael Petrie’s work has been featured in national and local publications including The New York Times, The Washington Post, The Philadelphia Inquirer, Philadelphia, Main Line Today, MainLine, The Hunt, Country Gardens, Architectural Digest online, the Philadelphia l Flower Show blog and Pennsylvania Gardener magazine. To read some of these articles visit our Press page.